It's hard out there for a photo app these days. After the runaway success of Instagram, a lot of imitators popped up thinking that if they offered the same "snap, filter and share" features, users would flock to them, as well. Sadly, this means that we have legions of piss-poor imitations without any clear alternatives; as the filter features became more ubiquitous, they almost provoke a roll of the eyes when announced. Unless an app fixes glaring problems with the market leader or offers some other kind of of advantage, users will find themselves wondering "What's the point?" 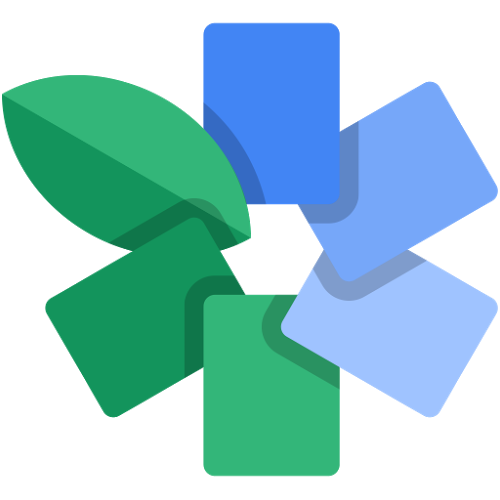 I was interested when it was announced that Google would be acquiring the Snapseed because it seemed almost in reaction to Facebook's purchase of Instagram. 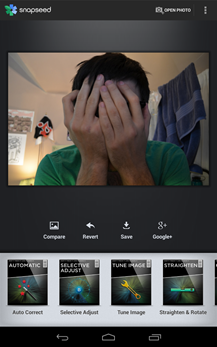 Snapseed had amassed a great following on iOS for offering a slick photo editing environment, so when they popped up on Android I felt it was worth a look. When you boot up the app for the first time, you're greeted with an overlay explaining the features. When you load or take a photo, you enter it into a menu for editing. You have numerous options, each with their own degrees of transformation: for example, I chose the "Grunge" filter for the photo below, along with some saturation options, color correction and tilt shifting. As many photo editors will tell you, working with images comes down to the ability to be precise. However, in a touch environment, the user tends to be much more reliant on sight and what looks good as opposed to what graphs and histograms will tell you. Snapseed is controlled by pinching and swiping, which will manipulate effects in varying degrees. You will often reach one extreme by the time you drag your finger to either side of the screen, allowing you to see what's just right for the particular photo. Swiping up and down will also bring up a context menu that will allow you to select different parts of the particular filter to edit; for instance, you can change certain patterns that are applied along with color effects. This will be extremely different from what Instagram users are used to, as there are just so many more possibilities with fine control when compared to Instagram's "click and forget" functionality. 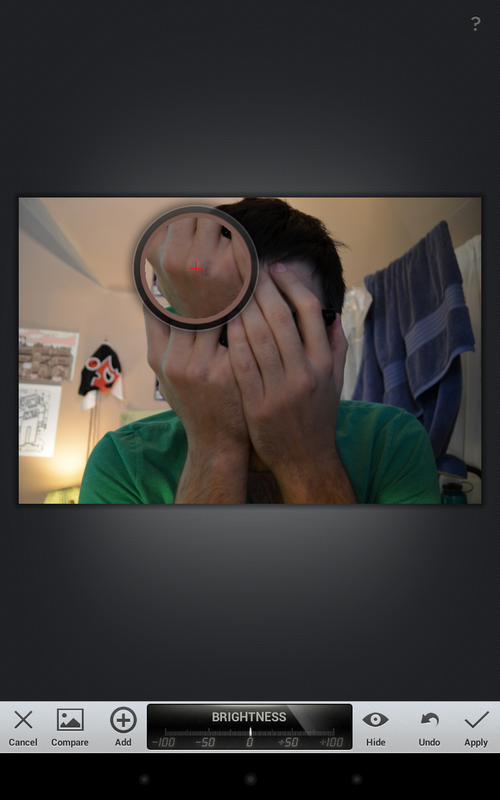 The filters themselves are varied and can produce a cool number of looks for each photo. As you can see in the screenshots, the Grunge filter seemed to make my hands look about fifty times more grimey than usual. 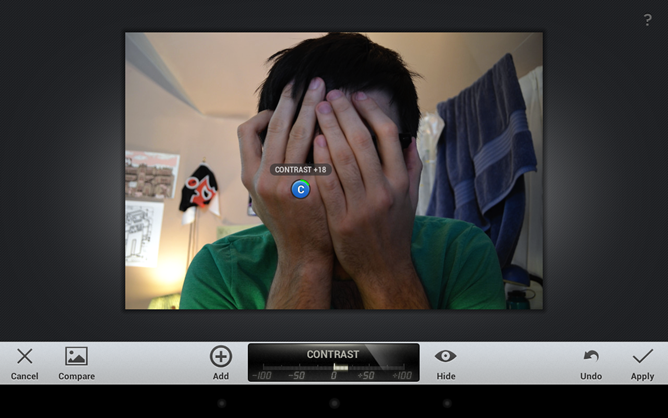 There are also frames, cropping, and straightening options. However, for those who want something a little more... mature, Snapseed allows for a really speedy correction of color/brightness settings for quick sharing. This is akin to Camera+, an app for iOS that can make a picture look a lot better than it really is without seeming overly fake. This goes a long way toward making me want to continue using this app, as sometimes the best editing is when you can't even tell it's there. 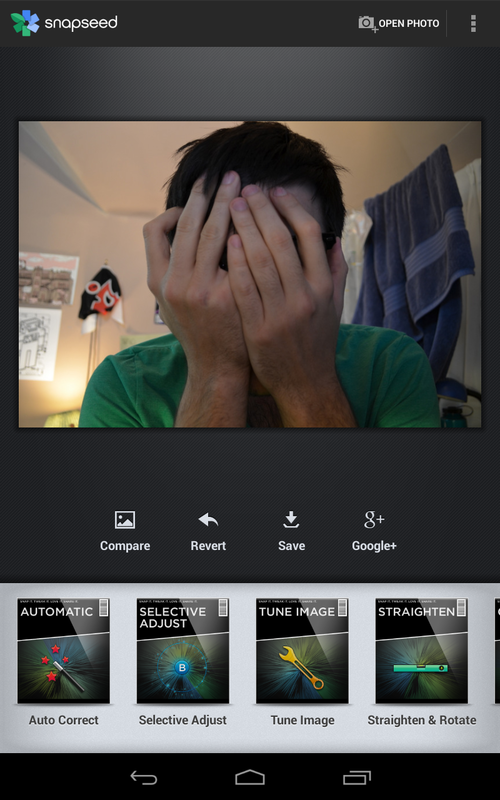 While it's not an incredibly fine editing software, Snapseed allows for a greater amount of time and effort to be put into a picture's presentation before it's shared. It also does so without any loss of quality, which is another big improvement over Instagram. As any user of that service will tell you, the more you edit, the more the quality degrades sharply. You won't find that problem here, unless you're choosing filters that specifically changes what's in focus and what isn't. Some minor complaints can be levied at the minimalist nature of the UI, and the reliance on gestures to get things done. By tucking different options away in a vertical swipe menu, it can be difficult to remember what's available; especially with oodles of UI space on the button bar, it seems like a waste not to use it. However, I can say I'm thankful for the "compare" feature, as it beats having to undo your work to see how much it's changed. 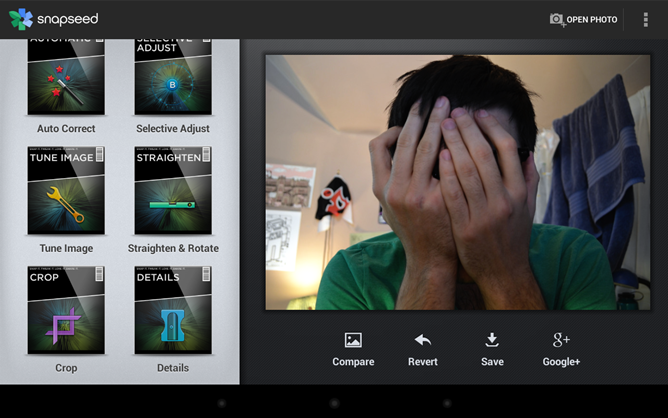 Snapseed can be found on the Play Store for free, and offers functionality that's worth much more. If you're planning to work with photos in any capacity on your Android, or want to have it just in case, you won't go wrong with an install.